I’m attempting to introduce popular ramen restaurants in Kyoto. I’m a little bit worry about body weight because of its.high calorie content, but I will try one shop per day. 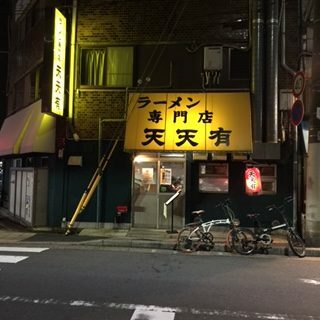 “Ichijoji”, famous as a birthplace of “Tenka Ippin” ramen shop is located in the north east area of Kyoto city. The nearest railway station is “Ichijioji” Station of Eizan Dentsu railway, but I recommend to use the one day ticket of Kyoto city bus, while visiting various places by bus. If you go there by bus from Kyoto station, take Route 5 at the bus terminal, Kyoto Tower side of the Kyoto station, bound for “Kokusai-Kaikan/Iwakura” and get off at “Ichijoji-Kinomotocho” bus stop. My first visit of this series is “Ten-ten-yu” Original shop. 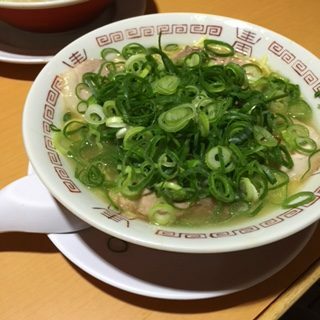 The ramen is served with thick chicken broth with a generous amount of leek ! Of course, I had all soup till the last drop. Addition of garlic pepper and red pickled ginger enhances the flavor of Ramen, and it was very good taste! Price of 650 yen is a good value for this satisfaction. Kyoto and Ramen lovers, why don’t you enjoy both tourism in Kyoto city and dinner at Ramen shop ! !